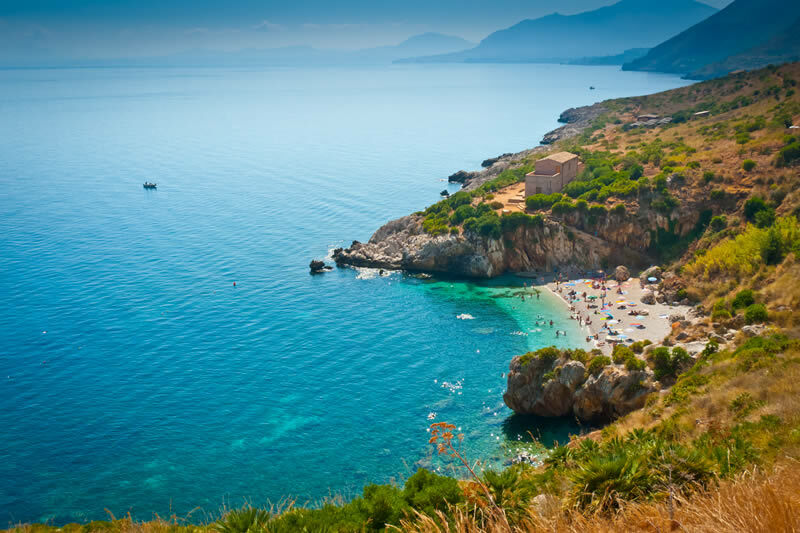 The Zingaro Natural Reserve overlooks the Tirrenian sea; during summer, its seashore is the main destination for all those who are looking for a little piece of heaven lying deep in the Mediterranean shrub. Thanks to a very clean and pure water, the sea is perfect for scuba-diving lovers: very rare algae and sponges, red coral and sea turtles. Every single visitor is fascinated by the fauna that the Zingaro Nature Reserve offers: a lot of protected animals such as the Bonelli eagle, as well as a wide range of birds (buzzards, owls, nightingales), mammals and reptiles. The flora is quite impressive as well: more than 650 plant species – some are very rare, like the Limonium todaroanum, that grows at 750 mt. above the sea level on the rocks of Mount Passo del Lupo. The Zingaro Reserve also houses more than 25 orchid species: if you are fond of these wonderful flowers, you may want to visit this area from March to June, when most of them blossom. The “half-coast” path of the Zingaro Nature Reserve is the one that will give you astonishing scenarios: it’s the most panoramic route, stretching for 8,5 kilometers (about 4:30 hours walk) from the South to the North. Blocks of houses that now welcome visitors during summers and water supplies can be found along the road, and during spring the breath-taking panoramic view is enriched by the blossoming of orchids. The high path is the most difficult: 17,5 km for a seven-hours walk. Nevertheless, for its flora, its landscape and its panoramas, it’s really worth a try. Aleppo pines forests, rural blocks of houses, and of course stunning views of the whole area surrounded by the Tirrenian sea. The beauty of the unspoilt, wild and rich Zingaro Natural Reserve makes this place one of the most wonderful of the whole island. During your stay in Scopello villas, don’t forget to plan a visit to this stunning destination: its sea, its bays and cliffs, its flora and fauna will leave you completely speechless and will give you a truly unforgettable holiday!